Even a man of Abdulmalek’s genius couldn’t rely simply on luck not to get caught. So he created his own luck. Abdulmalek Janmohammed was a smart man, no doubt, but the banking system had already seen many men and women much smarter than him. They had made mistakes and been caught, and he intended to stay a free man. So how did he manage to survive for so long without getting caught? Abdulmalek entered the Kenyan banking sector a few years after a man called Andrew Ngumba was caught in a fraud almost similar to the sack of Imperial Bank. Ngumba, after whom Ngumba Estate is named, was a politician who served as an MP and the mayor of Nairobi. In the late 1970s, Ngumba entered the financial market with a bank called Rural Urban Credit Finance Ltd. It was a runaway success, offering loans to small businesses and matatu owners. In 1984, Central Bank of Kenya inspectors, most likely acting on a tip-off, raided Ngumbas offices at Ngumba House on Tom Mboya Street. They carted away mountains of files, most of them relating to the bank and a few other microfinance units he ran. 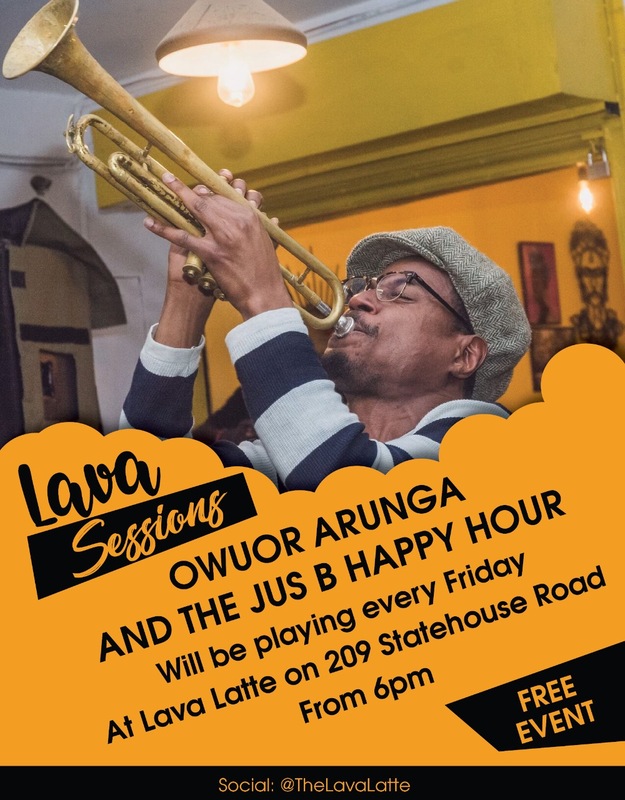 In the records they found a 140 million shillings black hole, triggering a chain of events that ended up breaking the Kenyan banking system. Ngumba’s mistake, it would seem now, was that he got reckless and let his vanity make him feel invincible. He had trusted the veracity of his own wits over networks, and soft blackmail. When a young Abdulmalek Janmohammed walked into Diamond Trust Bank as a management trainee a few years later, the Ngumba case was still a fresh lesson. It had morphed by then into an international incident, roping in at least two European countries and Kenya. For Abdulmalek, that experience was a key lesson into how not to get caught. If you worked under Abdulmalek Janmohammed, he could pay, play and fire you at will. Every day was a chance to cement a form of control on his employees, to keep them in awe of him. Only he had a 360-degree view of the bank. 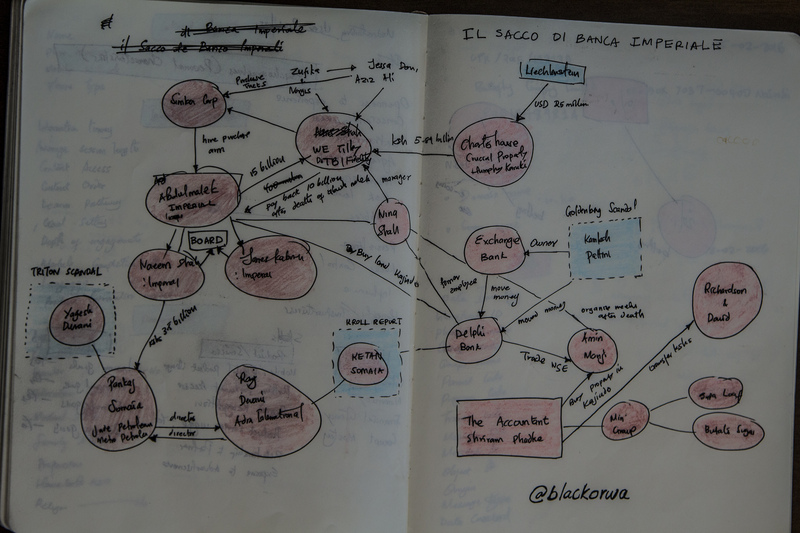 A sketch of the intricate web of The Sack of Imperial Bank. His bank’s internal audit office fell in this category. The 2012 whistleblower email most likely came from a middle manager, either within the internal or external auditor. The main ruse itself was carried out at the very top. Naeem Shah, as Head of Credit, would move the money. James Kaburu, as the CFO, would be the guy to make the books balance. Using the accounting software Flexcube, Kaburu tweaked and played with the numbers to make sure only a few keen eyes would ever notice. Sometimes he made errors and had to chase down the records from the human beings who had received them. Its hard now to establish when or how Abdulmalek figured out that he could have the software do the hard work for him. Or who suggested it. At some point in the mid-2000s, Abdulmalek sent a few mid-level IT staff to India to learn how to tamper with the core banking data platform. It was an investment, seeing that the amounts of money he was siphoning already would need to be covered up. For as long as he was alive, the book would always seem to balance. That is, the books he shared with the world. When the man who gave Abdulmalek Janmohammed a bank died in 2013, he still believed Imperial Bank was a healthy investment. It had only grown in its two decades of existence, and it would still enjoy such remarkable leadership for a while longer. Abdul Karim’s seat at the head of the table went to one of his sons, Alnashir Popat. Alnashir is the man who would lead his fellow directors to CBK to report the black hole they had found in the bank. It was him who would make a sorry sight before news cameras while apologizing for failing the banks depositors. When Alnashir Popat and his fellow directors walked into the dull imposing building on Haile Selassie Avenue, no one believed they had had nothing to do with such a long-running fraud. The Banking Fraud Investigations Department was immediately called in. All the directors passports were confiscated and their financial records investigated. A fraud investigator recently intimated, on condition of anonymity, that if the board was in on it, then they must have hidden their share of the loot incredibly well. The one thing anyone who knew Abdulmalek says about him is that he was confident to a fault. Since he was a guarded, private man, he always seemed to exude confidence in himself and his content. With his peers and the older men within the Imperial Bank board, he combined it with flawless lies. Before the appointment of new directors in 2012, he made sure none of the other directors knew the bank better than him. It was his empire, and he would have reached. Even bank depositors still don’t understand how the body that should have provided the first line of any real defense could have failed them so badly. For the board, the greatest sin was naivety and over-trusting a man just because he said he knew his bank. He was the only executive board member for the more than two decades he led Imperial Bank and, using this power, played on everyone’s confidence in him. Whether any other board member was involved in the ruse has not been established, but the collective board’s failure to stop the man for nearly 14 years remains its greatest blot. The one thing Abdulmalek Janmohammed knew about human beings is that we have one fatal flaw; greed. He knew everyone had a price, everyone could be bought for just the right amount. If not of money then of the ability to make more than they already had. This knowledge worked perfectly on the man who led the audit firm that should have called the cops on him. During the day, Atul Shah worked and still works as the CEO of PKF, one of the top-tier audit firms in the world. IBL’s books passed through PKF’s hands and all their reports came out clean in those 14 years. They even gave the bank a clean bill of health months before the story broke. When Abdulmalek died, that wall came crashing. His fellow directors called in the big dogs, a forensic investigation firm that, for 6 straight days, turned the bowels of Imperial Bank upside down looking for the loot. They didn’t find it, but they found smoking guns lying all over. In at least two companies, one of them Mundika Sugar Company and the other, Astonfield Ltd., the MD of Imperial Bank and the man who was supposed to audit him were equal partners. Astonfield had an unsecured, unauthorized loan of Kshs. 263 million at the time of Abdulmalek’s death. 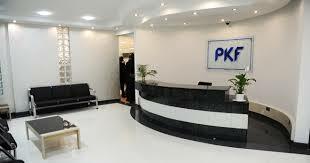 One company profile only defined the CEO of the auditing firm PKF, Atul PK Shah as A well-accomplished consultant in the region and has wide range of reputable corporates on his client list. It was a vague description, meant to be as ambiguous as possible. In news stories, this connection would disappear in the details, with Atul Shahs full name written out to appear as if it was someone else. But it gets even stranger. In digging through Abdulmalek’s lists upon lists of special loans, the name ‘Rajan Shah’ appears among borrowers with unsettled loans. 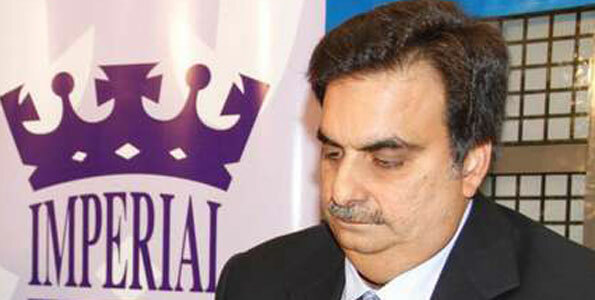 Rajan was the partner at PKF in charge of handling Imperial Bank. The loan itself, amounting to Shs. 2.995 million was actually given in 2006 and was never repaid. Abdulmalek, again being a diligent banker and an investor in human relationships, kept a record of it for nearly a decade. Since it was never paid, and never recalled, it seems to have been the thread that kept the auditing firm churning out clean bills of health. Abdulmalek had long figured that the only way to beat the system was to rope it in. Even if anyone within the audit firm ever found the hole, that story would never make it out. The strange email from 2012 most likely came from an auditor, internal or external or staff whose conscience had gotten the best of them. In either case, the reason was that it was impossible to go through the normal channels. Abdulmalek understood that at the top of the pyramid stood the mecca of Kenya’s finance. The dull building on Haile Selassie Avenue that homes Kenya’s central bank was, in fact, the only place in the world that ever really scared him. But even with its sharp teeth and far-reaching claws, it was a human system. And human system have a flaw, humans. In a rather cleverly hidden folder in his Google Drive, Abdulmalek kept a list of special loans. One sheet within the list was clearly marked CBK loans. He didn’t keep the names, just what looked like codes he gave his loanees. He was paying off people within the bank by giving them money when they needed it, but with strings attached. He never really expected the money back, people in his position never really do, but he expected them to pick his calls even if it was after midnight. If money was flowing their way, they were his to control. An email submitted in Court between IBL’S CFO and a senior manager gives a clue of how high the mess went, and how ridiculously reckless it was. In it, Kaburu, the CFO, asks the manager to delete some entries from the top 50 borrowers list. The contents of that list, crucial for every bank or any group that handles loans, changes depending on where in the files you find it. The one that made it to the board is not the one that ends up on the CBK side. The third highest borrower, according to what is so far regarded the most credible list, was a company called Italbuild Imports Limited. 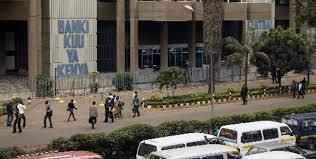 Italbuild was, at the time it took a 1.2 billion shillings loan, the company renovating Central Bank headquarters. The loan was unauthorized but the bank transfers left a trail. For Abdulmalek, these numerous links were not simple loans to friends and friends of friends, he was expanding his network. In Kenya’s already murky financial world, Abdulmalek built a web around him where he was the Don. He knitted his ropes so smartly that the new governor has had come to publicly ask for additional time severally. If he cuts the wrong thread, he would have to hang his own people. But it was even bigger than that. There is small seaside beach resort town on the Gulf of Thailand called Hua Hin. On one of its magnificent white sands beaches, there is a destination spa that calls itself “The Haven of Life.” Its official name is the Chiva-Som International Health Resort. As a health and wellness spa, it focuses on giving every guest a total life transformation. It attracts celebrities and business executives from all over the world, eager to not just get away from all the noise, but to also heal and meditate. In August 2011, Abdulmalek Janmohammed sent them a high-profile client. For the five days between August 24th and August 29th 2011, this luxury spa hosted three Kenyan guests. Only one name was recorded, Mrs. Ndungu. Her company was only recorded next to her name as 2 Pax. 21 days before this, a lady called Nancy Ndungu had sent an email from her official company mail to Anne Mboya, Abdulmalek’s trusted personal assistant of 19 years. Anne printed the email, hand wrote on a space on the right MD: FYI-Please advice. The Bangkok Retreat: Screengrab of a printed copy of the email, submitted in court as part of a Judicial Review application. There was almost nothing suspicious to this email at first but a quick connection of who exactly Nancy Ndungu is, and who her husband was at the time, changes everything. Nancy Ndungu is Prof. Njuguna Ndungu’s wife. At the time this email conversation was happening, the professor was the head of Central Bank. He was the man charged with regulating the market and rooting out rogue bankers like Abdulmalek. At some point in the weeks before this email was sent, Professor Njuguna and his wife had intimated to Abdulmalek that they would visit Thailand in August for a conference. Perhaps he, in his closed groups, spoke about his frequent trips to the Asian country. When the couple told him they would be making the trip, Abdulmalek must have recommended that the high-profile couple visit the health spa. Mrs. Ndung’u, in the email, refers to “the resort” indicating a prior offline conversation. For the couple, it was a chance to heal. For Abdulmalek, it was a chance to acquire power over the only person in the world who could destroy him. It was an investment into not getting caught. But Abdulmalek was not just giving directions to his friends. He also sent a credit card authorization, complete with scanned copies of his personal credit card, to the health resort. He filled and signed the authorization, and circled the part that allowed All Charges to be charged to the credit card. The guests would be Mrs. Ndung’u and her company of two. 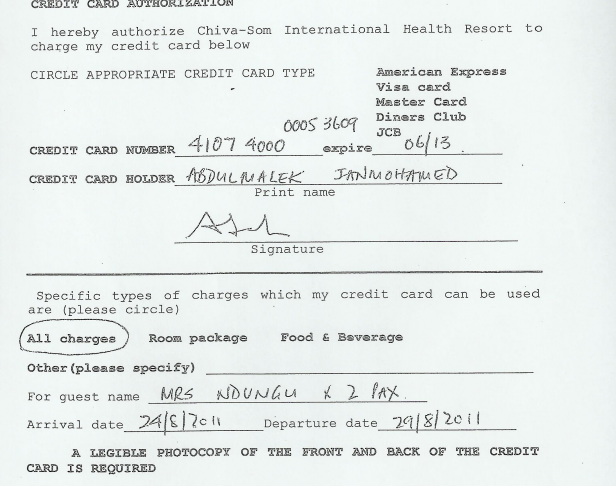 A screengrab of a printed copy (of the scan) of the credit card authorisation to the destination resort spa. Also part of the Judicial review application. As Abdulmalek handed over the signed authorization to Anne Mboya to scan and send, he smiled. He had caught a big fish. In fact, the biggest of them all. Abdulmalek’s hand reached out from beyond the grave, making sure that everyone looked guilty. The Board, as the first real line of defense, would automatically have to answer questions from everyone about where the money had gone. The auditor would have to retreat, battling questions as to complicity and other integrity issues. The regulator, in this case, CBK, would be torn between cracking the whip on everyone, including its employees, and saving the bank, or fighting for it to go to the graveyard with all the evidence, killing any chances of successfully untangling his web. It would have to reach back to its former boss, setting the stage for a deck of cards. For all his faults, one has to admit that Abdulmalek was a master of manipulation. Every interaction with another human being was a chance to rip right off the first chapter of the Godfather. Which he did with utmost foresight. He built a deck of cards that didn’t quite fall to the ground when he did but one that could not survive without him. The Sack of Imperial Bank is still an ongoing story, with twists and threads emerging every day. One of the most recent ones was a judicial review application, essentially a complaint by the banks shareholders that the receivers banks, DTB, and KCB, were raiding the bank of its employees. It also raised conflict of interest issues, as DTB’s CEO serves on the board of the Kenya Deposit Insurance Corporation. For depositors who trusted Abdulmalek Janmohammed and his bank with their money, the death of the man was the beginning of a fresh, painful narrative. While alive, he had built them a bank too. A bank that treated its clients like royalty, true to its logo. The first time Abdulmalek Janmohammed ever robbed his own bank, he must have learned the most important lesson of all. That the best way to rob a bank is to run one.